While in Maryland and Virginia recently our Extension Nursery Landscape and Turf Team of diagnosticians admired crepe myrtles (Lagerstroemia indica) in whites, reds, and lavenders. Absolutely gorgeous trees for their flower displays and their attractive bark. Yet. Outside of a Virginia lunch spot something was amiss. I had seen powdery mildew on crepe myrtle leaves before, but had not noticed how much this fungus could mar the flowers. In fact, when I first saw the flower display I thought that the blossoms had just aged and that this was a not so great aspect of crepe myrtles. As we looked closely though, it was evident that powdery mildew was ruining the blossoms, mostly the fused sepal cups holding the showy petals. As Shakespeare might say: All plants make faults. 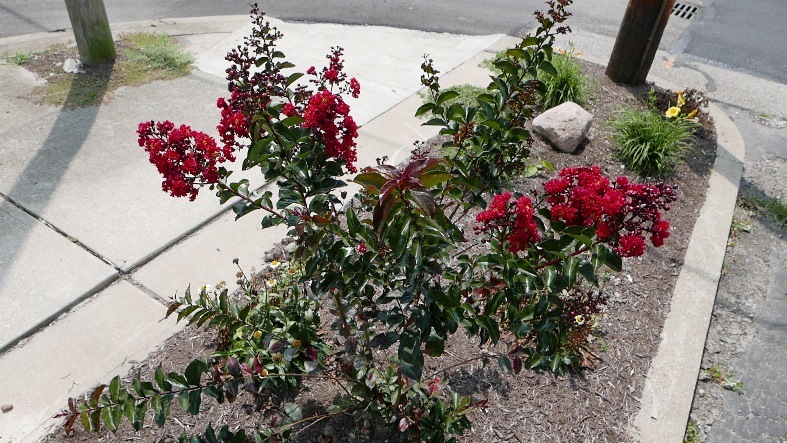 So, it was with great pleasure that my first day back in Wooster, there were some dwarf red crepe myrtles – and the blooms were glorious – and free of mildew. Of course, crepe myrtles are not new to Ohio, although with cold-hardier cultivars and climate change they are successful further and further north in Ohio. And, of course, powdery mildew will develop on Ohio crepe myrtles too. Yet, who says the South alone is for crepe myrtles? Note: I am using “crepe” instead of “crape” here to represent the “crepe”-like flower petals.